FAQ – How is the Sling Library Funded? The simple answer is it isn’t, the library doesn’t received any external funding to run. Instead the idea is that it pays for itself through the rentals and donations. It’s taken a while, but for the most part the Sling Library sessions do now just about manage to pay for themselves in a sustainable way. By this I mean it earns enough to cover on going insurance costs and of course for the slings and carriers themselves. Interestingly, the library alone does not earn enough to pay for my training or my time. In an ideal world it would, but in reality I’ve found the balance between keeping both the sessions and the hire fees at a accessable and affordable level has meant that these costs are simply not covered by the library. And so I simply choose to donate the time these sessions and the resulting admin takes. I think this might be a real suprise to many library users reading this. I am often asked (particularly during busy sessions) why I don’t simply run more sessions. Or if I could start this weeks session 20 minutes earlier because someone has x commitment, or if they can arrive as the session is finishing because they have y commitment. And while I would love to run more sessions, and run longer sessions and would love to help everyone find the right sling and become completely confident using it…. I have to balance this with the needs of my family and what I can sustainably manage to offer while not charging for my time. I have balance my desire to keep the sessions and hire fees affordable and how much time I can afford to donate for free without negatively impacting on my family. For now this balance has been acheived at 3-4 sessions a month – or at least when the sessions stick to time and don’t run over! Sessions running over is something I continually struggle with! If I sometimes seem impatient with questions and requests when its already 20, or 30 minutes after the end of the session time please forgive me. Please understand that my frustration is not at you but my own internal struggle to between wanting to help and wanting to answer ALL the questions and my guilt that I haven’t made lunch for my daughter yet, and I need to pick my son up in 2 hours and I promised I’d fix that thing for him before he got back and I’m now worried I won’t get time and I am starting to feel that frustration that something that I do to satisfy my need to volunteer and help is now taking more of my time and resources than I can afford to give. I know that I need to get better at drawing these sessions to a close. It’s hard when someone is front of you asking for help to say no, but in reality these sessions can only remain affordable and accessable if I can keep them to time and if those who do need more help (and can afford to) take the private consultation or workshop route instead. Particularly as it is private consultations, workshops and sale of slings that pay for my training costs, for my time and plug any gaps in finance that the Library side has. Again these don’t make huge amounts, but they do keep it all going and make it possible! The other question I often get around funding is about the slings and carriers themselves. Many people assume that the brands simply give me these carriers, but in reality this is extremely rare. Most I have bought. A small number I’ve received in exchange for working at a show or product testing and a similarly small number I’ve been very kindly gifted by the brands or distributors directly. But the vast majorty I’ve paid for. Fortunately, most I’ve been able to buy at discounted rate – as many brands recognise the importance of Sling Libraries in allowing potential customers to try before they buy. With new carriers being released all the time this is of course an ongoing process!! Hire fees and donations from the Sling Library sessions are constantly used on purchasing new carriers to keep collection upto date and meet demand for more popular carriers. Tell you friends! Whether you’ve been to a sling library or not, telling your friends, a new parent or expectant parent can make a huge difference. Personal recommendations are always more powerful than any paid adverstising and often people have never heard of a sling library or are not sure how one might help them but are delighted to discover they exist once someone tells them about it. Write us a review on Google or Facebook. Reviews and recommendations on social media help people find us. Comment on our posts on Facebook and Instagram, maybe even consider sharing a post occasionally. The more comments and shares a posts gets the more that people get to see that post and other similar posts. Simply liking a post no longer helps it get a wide distribution – so the best way you can help any small business or Sling Library is to comment on their posts as this helps Facebook know to show more people this post! Its sad but true but most of my posts are show to only half, often a lot less than half of those who like my page let alone anyone new. But those posts that do get comments go out to far far more people and can really help get the message out to as many new parents as possible. My day started getting my two children up, dressed and fed, before moving onto playtime – today building epic duplo and stacking cup towers. Normally, I’d also need to take Tom to school but as it’s the last day of summer holidays, instead I waved him off to a playdate with a friend so that he didn’t have to be bored hanging around sling library. Then it was time for me and Rachel to set up for sling library – getting the dolls out, sign in sheet ready, room tidy, online hire form loaded up etc. First parent arrived at 11.05 and last left at 1.30. Today’s session was actually unusually quiet with just 7 families (4 new, 3 returning). Recently its been more like 9-12 families, but as I only got back from holiday at 6 pm the night before I was quite relieved not to be run off my feet for a change. 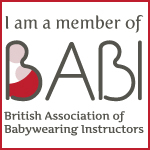 We covered stretchy wraps, Caboos, ring slings, Woven Wraps and Buckle carriers – so a bit of everything really! Common themes were babies who didn’t like to be put down and parents with understandably aching arms, and babies who fussed going into slings understandably worrying their parents and knocking their confidence. All things that the session could address!! While the session is advertised 11 till 1 it is not at all uncommon for it to over run, as it did today – especially on a day like today when the 5 of the 7 arrived within the last hour. As soon as the session finishes Rachel and I have lunch then we go for a sleepy walk, usually before I tidy up. She normally naps around 1pm but Sling Library days nearly always push this a lot later for her – more like 2pm. I try to console myself that it’s just 2 days a month!! Fortunately for me she is very tolerant! Then it’s onto tidying up for me – the quieter session ment it was a much smaller pile than normal and today it only took me about 10 minutes… after a busier session this can be more like 20! Maybe even more. Then the rest of the day until bedtime is spent with Tom and Rachel and focusing on their needs. Last day of summer holidays and tiredness got the better of Tom today and he became really over wrought, he asked for a special mummy back hug and I was only too happy to give him that closeness as I got dinner ready. Then bedtime and finally at 9pm I can sneak out their room and start my post sling library admin. This includes following up with people I spoke to today, maybe sending an article I mentioned, or maybe info on where to buy (and discount codes etc!). As well as chasing slings that haven’t come back. This can take anywhere from 30 minutes to nearly 2 hours depending! This evening it took about 1 hour. The biggest factor is how many overdue slings there are, following up outstanding slings are always the emails that take me the longest to write. Fortunately their weren’t too many of those this evening. Then off to bed with me!